Levi’s Brown Leather Lace Up Boots. A few marks on leather. Levi's Size 10 Men Boots Mid Ankle boots. 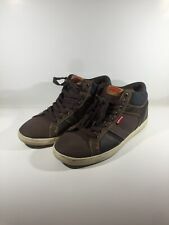 Synthetic Uppers.Casual Brown. Shipped with USPS Priority Mail. We try to capture everything and describe everything in the list, but we may lose things on occasion. All shoes are washed internally and externally including insoles. Upper: Canvas / Denim. Style: Lace-Up Boots. Design: Richmond. Pair your favorite pair of jeans with denim boots! Color: Black Denim. Padded tongue and collar. We are here to help ! Brown Leather Black Canvas. Lace up. Worn maybe once. Thank you! No holes, rips, tears, odors. Minor dirt and wear. Levis Brown Leather Lace up Boots. Light Brown Leather. These Levi's Dawson boots were worn twice, and are in like new condition. Black nubuck leather, rubber outsole. • Suede- Leather upper with rounded plain toe in laceup chukka boot style. • 6-eye laceup front with matching round leather shoelace. • Unlined suede (except leather lined collar and lacing panel). • Leather heel pool loop. Levi's denim boots in great, pre-owned condition. Soles show little sign of wear. There are a couple of areas shown in pictures that are distressed slightly and the pull on tab is missing on one of the boots. Size 8. Sole Length (Heel to Toe) 12". Widest Sole Width: 4.25". Excellent condition! 9.8/10 Great quality! Levi's boots. black and lace up. great condition have been worn but still great. New Levi's Denim/Leather Navy Blue/Brown Men's Casual Comfort Boots 518388-09U. Shipped with USPS Priority Mail. Never worn. Number marking on sole from my original purchase. MODEL STANTON BURNISH. Style Ankle Boots. Color Brown. Condition The item in the picture is the one you will receive. (SEE THE PICTURES. ).